Mayfield Falls offers some of the prettiest scenery Mother Nature has to offer. Driving through the tropical Jamaica rainforest, the first thing you notice is the clean, fresh mountain air... Come experience Jamaica's #1 eco-tourism attraction and nature at its best! Mayfield Falls is a scenic 1 hour drive from Negril, Jamaica, 1 and half hours from Montego Bay, and only half hour from Lucea. Centrally located in Glenbrook, Westmoreland, where the Dolphin Head Mountains provide a picture-perfect backdrop. Mayfield Falls is one of Jamaica's many waterfalls which cascades down though one of its many mountains. Originating out of the Dolphin Head mountains Mayfield falls is a wealth of Mother Nature. Situated in Glenbrook Westmoreland it is centrally located within two of Jamaica's premium resort towns. 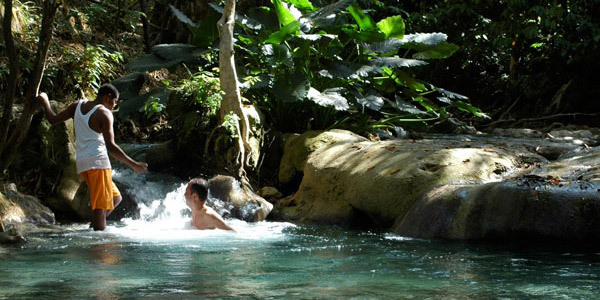 Mayfield falls is only a 1 hour drive from Negril and 1 and half hours from Montego Bay. This nature lover's paradise may not be as popular as some of the others but it is gaining its fair share of recognition.